Honey Sriracha Sausage Bites - sticky, sweet and spicy sausage bites with honey sriracha sauce. An easy delicious appetizer that is a crowd pleaser. It’s holiday party season and I have an amazing holiday appetizer recipe to share with you. These sticky, sweet and spicy sausage bites are absolutely delicious, so easy to make, and will be a crowd pleaser that everyone will go crazy about! The best thing about the recipe is that it’s effortless to make them, with this amazing Johnsonville’s Sizzling Sausage Grill. Little G loves sausages, and with this handy kitchen appliance, I don’t even have to fire up my as stove top to make the sausage bites. Johnsonville’s Sizzling Sausage Grill is an indoor electric grill, you can cook up Johnsonville sausages from the comfort of your own home, without all the prep or cleanup! The grill ensures perfectly cooked sausage in just 15 minutes, which is perfect for the busy holiday season so the hosts and hostesses can enjoy the party without being stuck in the kitchen, or burning their Johnsonville sausage. This holiday season, add Johnsonville’s Sizzling Sausage Grill to your wish list. Use the promo code “Sizzle” for free shipping and handling (a $14.95 value!). This promo is valid now till December 11 at SizzlingSausageGrill.com. So hurry up and buy one today! 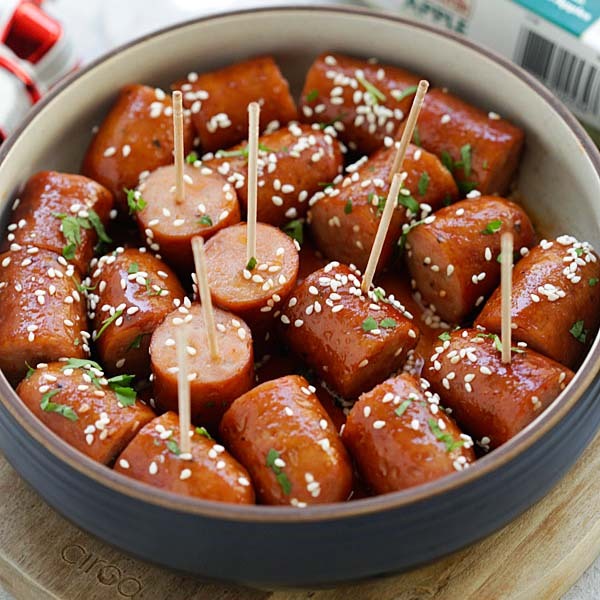 Please do try out my Honey Sriracha Sausage Bites recipe this party season. Double or triple my recipe. I guarantee you that your family, family and guests would love them! This is a sponsored conversation written by me on behalf of Johnsonville. 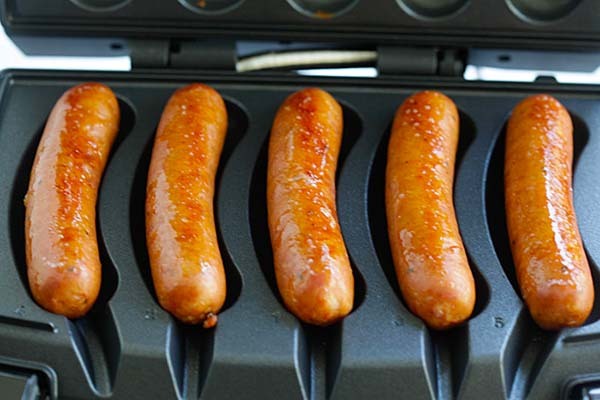 Arrange the sausage links on Johnsonville’s Sizzling Sausage Grill. Close the grill cover and turn on the power. Cook the sausage links for about 10 minutes or until the grill shuts off by itself. While grilling, prepare the honey Sriracha sauce by mixing the honey, sriracha, salt, vinegar and white sesame together. Stir to mix well. Remove the sausage links from the grill and cut each link into four pieces. Transfer them to a bowl and mix it with the honey Sriracha sauce. Serve immediately with toothpicks. All photos and recipes on Rasa Malaysia are copyright protected. Please do not use the photos and recipes without prior written permission. If you wish to republish this recipe, please rewrite the recipe in your own words instead of copy and paste and link back to //rasamalaysia.com/honey-sriracha-sausage-bites/. Thank you very much! Sesame oil? sesame seeds? sesame what? This honey sriracha sausage bites are looking very yummy and colourful,I can’t wait to try it to eat!!! It’s just fabulous!!! Thanks you. I really love recipes with sausage but had never found this one before. Definitely up there to try now! Hi, I don’t have Sriracha in my pantry, what’s the best substitute ? Any hot and spicy sauce will do. This sausage grill is really very delicious . I made it for myself and for my family and it was well appreciated by everybody. Also it is really easy to make. Especially my sister liked it very much, who has a wide range of ideas about cooking. Hi Nayeem thanks for your sweet comment. I appreciate that you love my honey sriracha sausage bites.